Pomegranate New York Sour. 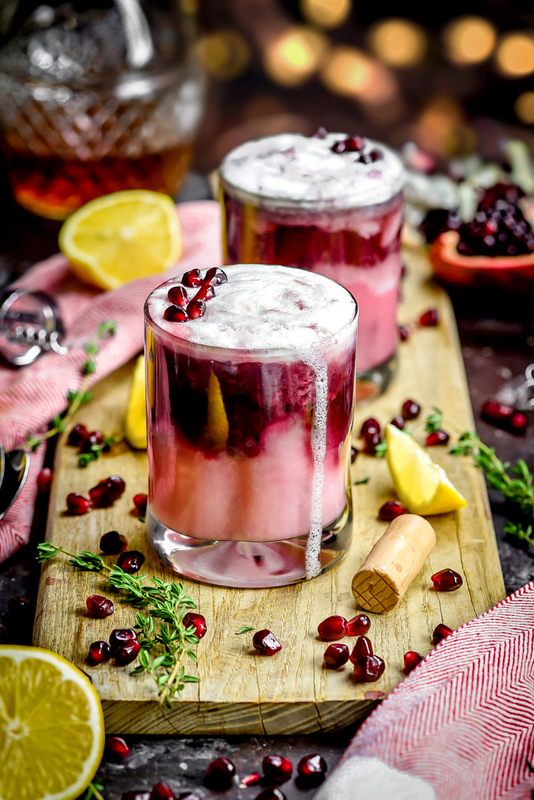 This tart and sweet whiskey cocktail features a red wine float and gorgeously pink, pomegranate-spiked base. 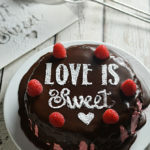 It’s the perfect cocktail for Valentine’s Day, and while it looks impressive and professional, even a cocktail novice can whip it together. Well, it’s still winter– we’re only halfway through it, in fact– and we’re running out of things to drink. We’ve sipped on spiked ciders, gleefully downed our egg nogs, and toasted with champagne from Thanksgiving to the New Year. On James’ birthday we enjoyed a bottle of wine with dinner, and we begrudgingly survived the most boring Super Bowl of all time with the help of a few heavy beers. We’ve cycled through the same drinks for every celebration and get-together in between. The point is, we’re bored. So, so bored of the same old winter beverages. What the heck does one drink for the remainder of February, before it warms up enough to enjoy a mimosa or margarita in the sunshine? 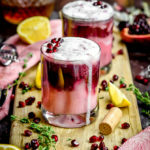 The answer lies in a drink that incorporates the best inebriates winter has to offer– whiskey and red wine– with fresh winter produce– lemon and pomegranate– to create a gorgeous, tart, and absolutely delicious cocktail called the Pomegranate New York Sour. And since we’re talking about getting through February here, let’s not forget about Valentine’s Day. 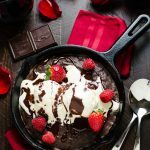 If the combination of wine and whiskey wasn’t enough to woo its way to your V-Day dinner (because honestly, what could pair better with a juicy steak? 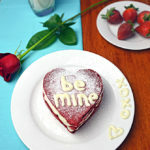 ), the gorgeous pink and burgundy color should seal the deal. WHAT IS A NEW YORK SOUR? The New York Sour is a classic cocktail that dates back to the 1800s. It’s got the same elements of a traditional whiskey sour– whiskey, fresh lemon juice, and simple syrup– but with a float of red wine at the top. 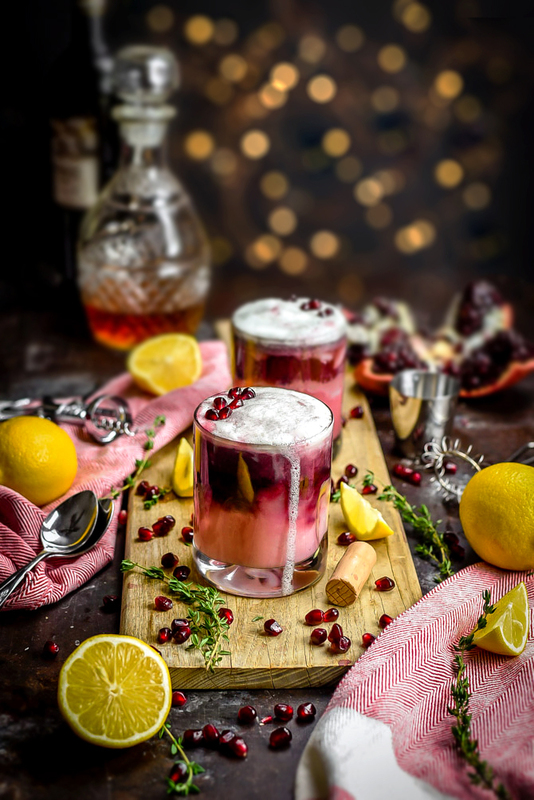 The red wine float brings added acidity, tannins, and fruitiness to the whiskey sour, while also adding a new layer of texture and color to the drink. Despite its name, the New York sour is actually thought to have been invented in Chicago– supposedly by the same bartender who invented the Manhattan. It was at first referred to as a Claret Snap, and as it made its way across the country, it was renamed “Continental Sour” and “Southern Whiskey Sour” before reaching its peak popularity under the name “New York Sour” in– you guessed it– New York City. The New York Sour became a go-to cocktail of New York speakeasies during the Prohibition-era. And while it’s not the most ubiquitous cocktail to have gained notoriety during that era, it’s still enjoyed to this day. Especially in New York City, where I first tried and fell in love with the drink. Given that the New York sour has been around for over a century, you might be wondering why I decided to mess with a good thing and by adding a new ingredient to the mix. And I’m here to tell you that if you want to drink the New York Sour as-is, I fully support that decision. However, the pomegranate twist adds another layer of bright, tart, and sweet flavor that blends well with the lemon and helps to mirror the fruitiness of the wine throughout the cocktail. Not to mention, it creates that beautiful color I keep going on about. 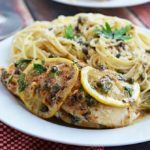 In order to add pomegranate flavor, I include pomegranate seeds in the simple syrup mixture. Just boil together the seeds, sugar, and water, and then let it simmer until thickened, about 10 minutes. At that point, you’ve got something very similar to homemade grenadine (which is made from reducing pomegranate juice and sugar), which you can use to add sweeness in Pomegranate New York Sours and other cocktails for up to a month. 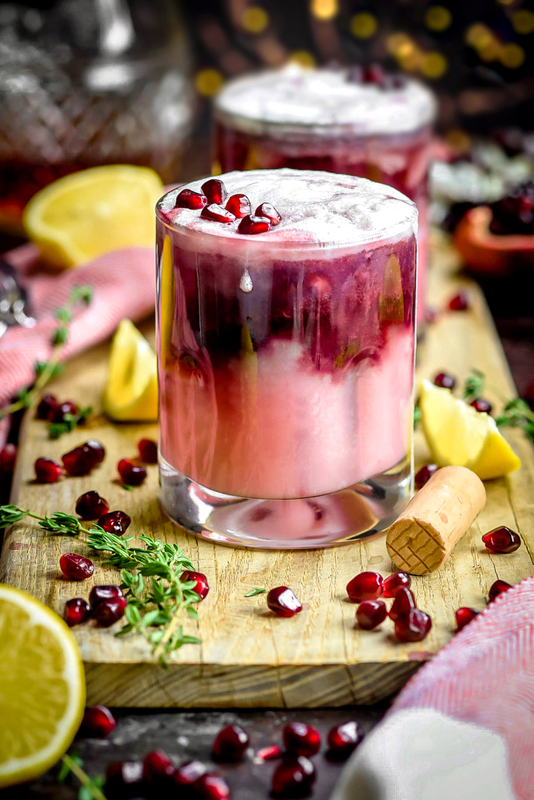 After preparing the pomegranate simple syrup, combine an ounce of it with whiskey (rye or bourbon both work), lemon juice, ice, and an egg white in a cocktail shaker and shake until the egg white has begun to emulsify and everything’s well-combined and frothy. Then strain it all into a rocks glass filled with fresh ice, and the egg white will form a foamy layer on top. 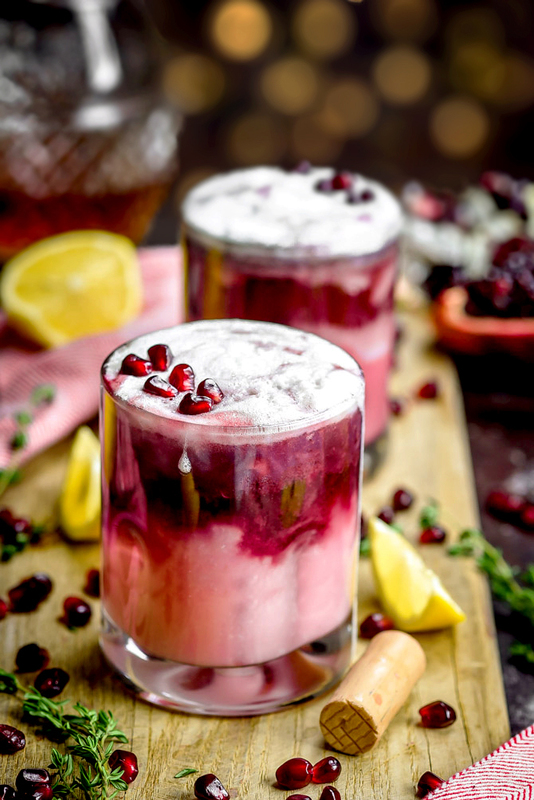 At that point, you might be wondering how to get the red wine float in between that layer of foamy egg white and the rest of the pomegranate whiskey sour. Hold a spoon upside-down over the top of the cocktail, just above the egg white, and gently pour the wine over the back of the spoon. That will do the trick. WAIT, WHY IS THERE EGG WHITE IN MY COCKTAIL? Egg whites add a rich, creamy texture to the drink and a foamy top, which makes the drinking experience all the more enjoyable without having to load up on heavy ingredients like coconut cream or whipping cream. Any “eggy” flavor is undetectable– it’s just there for the texture. A lot of people feel a bit uneasy about adding raw eggs to a cocktail, and it’s understandable. Salmonella is no joke. However, as long as you use fresh eggs, it’s incredibly unlikely that salmonella will be an issue (and if you’re the sort to lick the bowl of brownie batter or eat raw cookie dough, you’re already used to living on the edge). That being said, if you’re really uncomfortable with the idea, use pasteurized egg whites instead, or leave the egg white out all-together. It’s a great drink that you’ll be happy to get through the rest of the winter with, either way.